Even with shorter stays and new medicines available to treat patients, Osawatomie State Hospital frequently was over capacity as early as 2003. 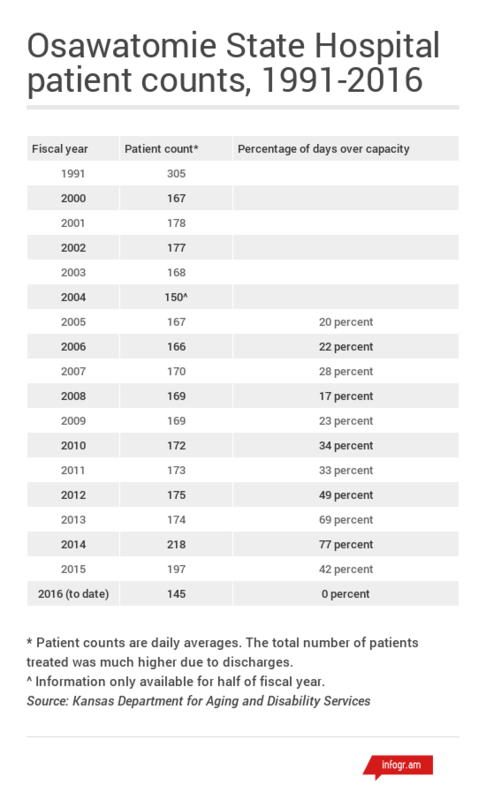 It topped its 176-patient limit often in 2005 and remained overcrowded for much of the rest of that decade. The problems that led federal inspectors to decertify Osawatomie State Hospital might have been prevented if a succession of Kansas governors and lawmakers had funded community-based mental health programs intended to reduce the need for state institutions. 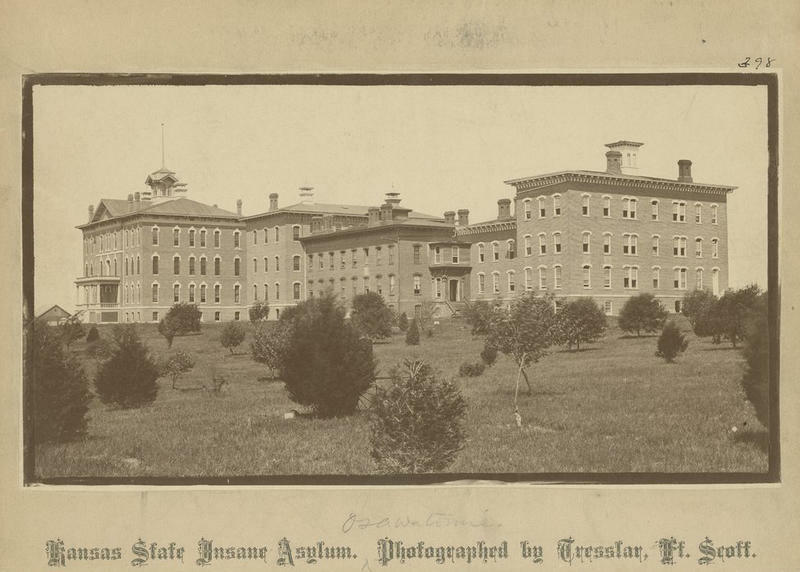 Kansas had relied on state hospitals to care for its residents with mental illness for most of the state’s history. It gradually reduced that reliance throughout the 20th century, and legislators saw an opportunity in the 1990s to shift more people and services to community mental health centers, possibly eliminating the need for the hospitals. 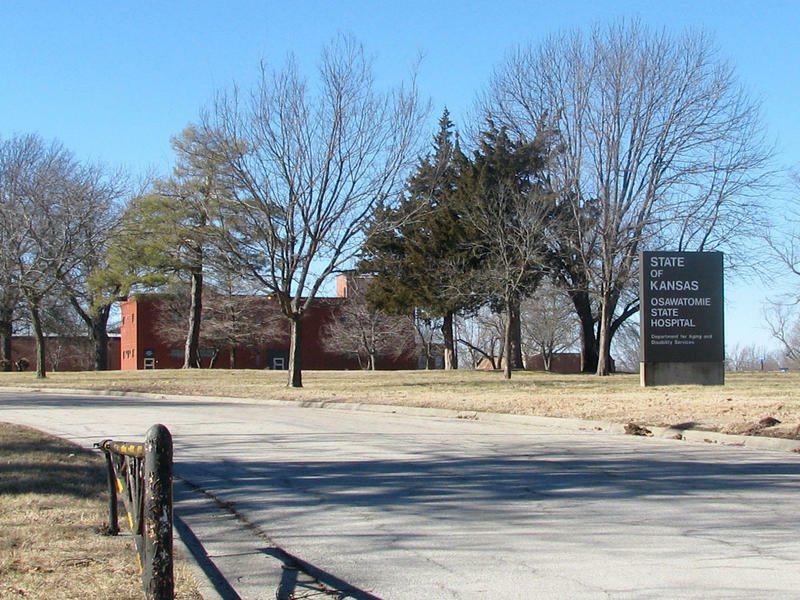 After Topeka State Hospital closed in 1997, the state had 340 public psychiatric beds, or about a third as many as it had at the start of the decade. Successive governors and legislatures had implemented reforms in the 1990 Mental Health Reform Act to de-emphasize institutional care. But they didn’t follow through with the funding that community mental health centers needed to fulfill their role in the new system. Through the early 2000s, the combination of those two factors increased the pressure on state hospitals to serve the needs of Kansans who had serious mental illnesses and nowhere else to go. Eventually, those strains would contribute to federal officials’ decision to stop paying to send Medicare patients to OSH, which in December 2015 they deemed a dangerous facility where care was lacking. Don Jordan, who was superintendent of Osawatomie State Hospital from 2002 to 2005, says newer antipsychotic medications allowed hospital to stabilize patients more quickly and discharge them to the community for care instead of keeping them for long periods of treatment. But even with shorter stays and new tools, OSH frequently was over capacity as early as 2003. The state hospitals were able to handle the pressure for a while, said Don Jordan, who was superintendent of OSH from 2002 to 2005 and secretary of the Department of Social and Rehabilitation Services from 2006 to 2010. Newer antipsychotic medications allowed hospitals to stabilize patients more quickly and discharge them to the community for care instead of keeping them for long periods of treatment, he said. “Things were possible that weren’t possible before,” Jordan said. Still, even with shorter stays and new tools, OSH frequently was over capacity, topping its 176-patient limit often in 2005. SRS tried various plans to reduce the overcrowding, starting as early as 2006, but OSH remained overcrowded for much of the next five years. Overcrowding is a safety issue because it raises patients’ stress, and therefore the risk of conflict, said Steve Feinstein, who was superintendent of OSH from 1994 to 1998. “If you’re mentally ill, you’re really struggling from day to day just to maintain,” he said. Units typically were over capacity by one or two patients, said Greg Valentine, who was superintendent of OSH and Rainbow Mental Health Facility in Kansas City from 2005 to 2011. But being above capacity was a concern because OSH often couldn’t admit new patients until someone could be approved for release, he said. Running over capacity was a challenge, but it wasn’t new or unique to OSH, said Ray Dalton, deputy secretary of SRS from 2006 to 2011. Ultimately, the situation at OSH came to the attention of federal inspectors. In 2006, the Centers for Medicare and Medicaid Services said that OSH wasn’t individualizing patient treatment and discharge plans, and would need to hire additional staff or risk losing its certification and federal payments. The hospital doubled down on treatment, Valentine said, and for a while federal officials were satisfied. It wasn’t smooth sailing from there, though. The Great Recession hit in December 2007, bringing with it reduced state revenues and increased admissions to state hospitals at a time when Kansas couldn’t afford more staffing, medications and other necessities of providing care. Psychiatric hospital admissions tend to go up during economic downturns, because extra stress can push people who struggle to manage their illnesses to the breaking point, Feinstein said. And because state hospitals are required to serve everyone who needs care, it’s difficult to control costs in lean budget years. The state held hospital spending roughly steady from 2006 to 2010. But costs soon outstripped the funding as patient numbers continued to increase. Admissions to OSH rose 12 percent from 2007 to 2008, which is steep compared to typical fluctuations. Despite the increased admissions, Valentine received only about half of the money he requested in 2007 to hire additional staff. One year later, OSH stopped paying overtime to its staff and dropped one of its eight treatment teams because of increased costs. That left the hospital with fewer employees to provide care for an increasing number of patients. 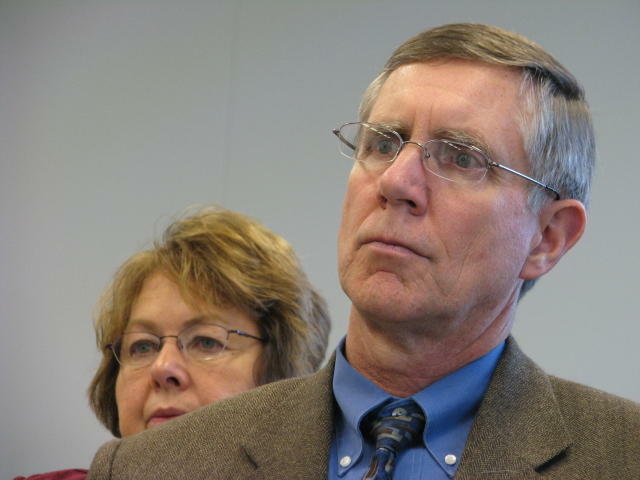 While serving as Social and Rehabilitation Services Deputy Secretary in 2008, Ray Dalton told Kansas legislators that failing to hire more staff could jeopardize care at Osawatomie State Hospital. At the time, SRS raised concerns that failing to hire more staff could jeopardize care at OSH. The Legislature and administrations of Gov. Kathleen Sebelius and Gov. Mark Parkinson, both Democrats, didn’t come up with the money to increase staffing at the hospitals, however. 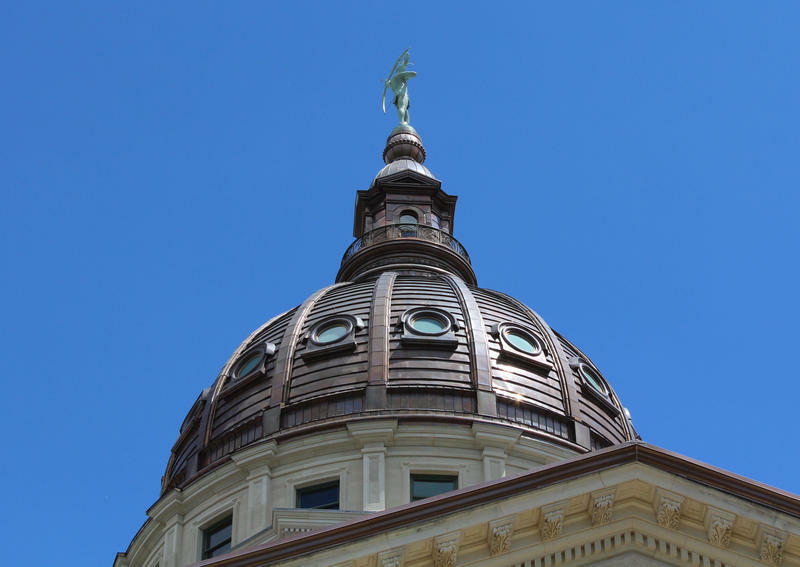 They cut funding for community mental health by 5 percent in fiscal year 2009 and 20 percent in 2010 as the Kansas economy remained mired in the recession. The cuts limited the ability of community mental health centers to serve the increasing number of people with psychiatric needs, and SRS instructed the centers to focus only on people with severe mental health issues. Like the hospitals, community mental health centers can’t turn away people who need their services. But sometimes they must reduce the number of sessions a person receives per week below the ideal level, said Bill Persinger, CEO of Valeo Behavioral Health Care in Topeka. They find ways to be more efficient but can’t always provide services with the intensity they would prefer, particularly as more people seek help, he said. “What you’ve had is a perfect storm of frozen or reduced funding, increased demand and fewer resources,” he said. A tension emerged in the public system as state hospitals and community mental health centers coped with increasing workloads — though representatives from each were quick to emphasize they didn’t blame their counterparts. Community mental health centers had concerns that some patients were leaving OSH before they were well enough to continue healing with the level of services available in their communities, Persinger said. At the same time, then-OSH superintendent Valentine said the hospital also noted delays when it tried to discharge a patient, because community mental health centers sometimes weren’t able to immediately provide needed services. 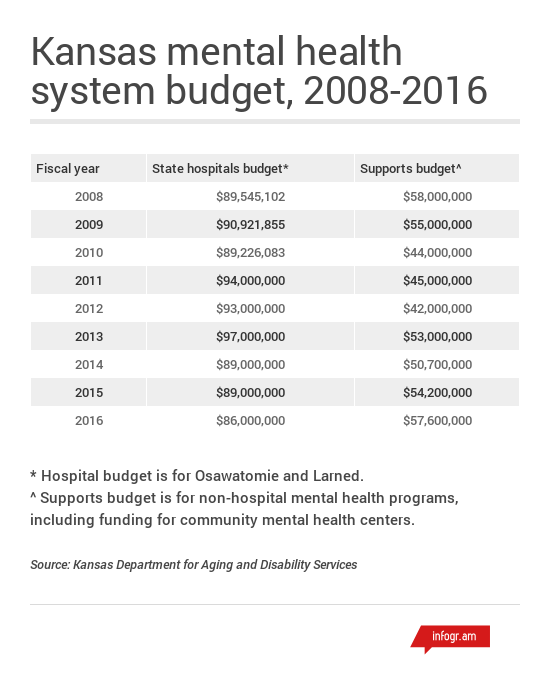 While some parts of state government have seen financial relief since the recession ended in Kansas in early 2010, budgets for community mental health centers remain below pre-recession levels to this day. The state hospitals fared better for a time, but their funding dropped below pre-recession levels in several years despite increased costs. In 2011, Rainbow Mental Health Facility in Kansas City, Kansas, was forced to drastically reduce its capacity. That left patients who would have used those beds few alternatives other than Osawatomie State Hospital. With overcrowding still an issue at state hospitals, SRS officials told the Legislature in early 2010 that people in crisis were being housed in jails if a bed wasn’t available. The situation worsened in 2011 when Rainbow Mental Health Facility in Kansas City was forced to drastically reduce capacity, leaving patients who would have used those beds few alternatives other than OSH. Federal inspectors had found Rainbow to be understaffed, and the State Fire Marshal cited it for numerous safety hazards that could make an evacuation difficult. SRS opened a new 30-bed unit at OSH to absorb some of the Rainbow patients, but that didn’t fully replace the 44 beds the system lost in Kansas City. Despite those challenges, federal inspectors gave OSH high marks in 2011. But it didn’t last long. An effort by the administration of newly elected Republican Gov. Sam Brownback to reduce staffing costs soon would set in motion a chain of events that resulted in the hospital’s decertification in 2015. Next: Recruiting and retaining employees at Osawatomie State Hospital has long been a challenge, but the issue worsened when a large number opted to take early retirement incentives. 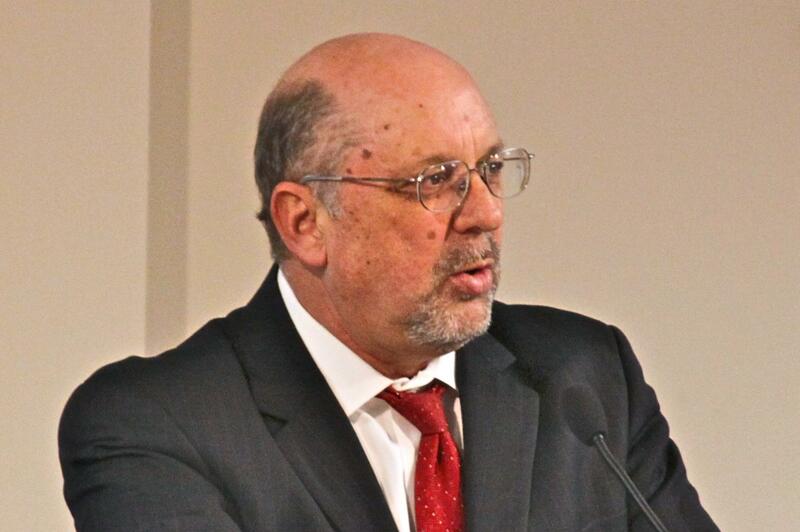 Kansas community mental health centers are sending a distress signal to state policymakers. The association that represents the state’s 26 community mental health centers issued a statement Wednesday expressing “strong concerns” about the $30 million in funding cuts that it says its members have suffered in the past 12 months. “The community mental health centers have taken one devastating hit after another over the last year,” said Kyle Kessler, executive director of the Association of Community Mental Health Centers of Kansas Inc.